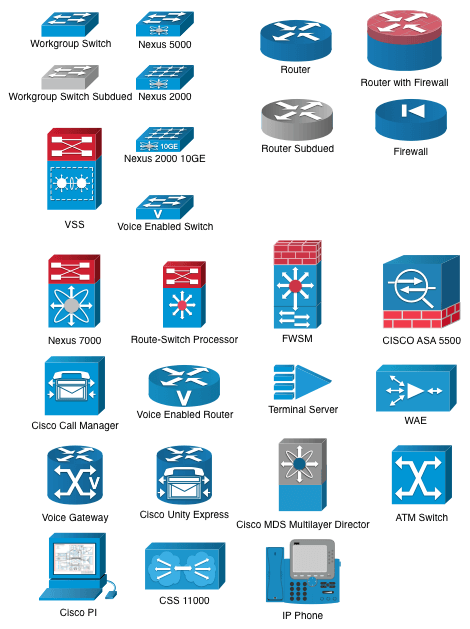 My version of the classic switch and router icons that we've all come to know and love. These icons are a bit cleaner than those that provided by Cisco Systems. I've done away with the borders and used gradients where appropriate. These icons are all magnetized and have the aspect ratio locked down. Additionally I've included label information that should help with laying out a network diagram and have also added data keys for hostname, IP address, and serial number. I've also included a set of stencils for both layer 2 and 3 links and port channels. These have data keys that will help track IP addresses, VLANs, routing protocols and so on.